Big things you can see—like a beam of light half a million light years long — need big explanations. 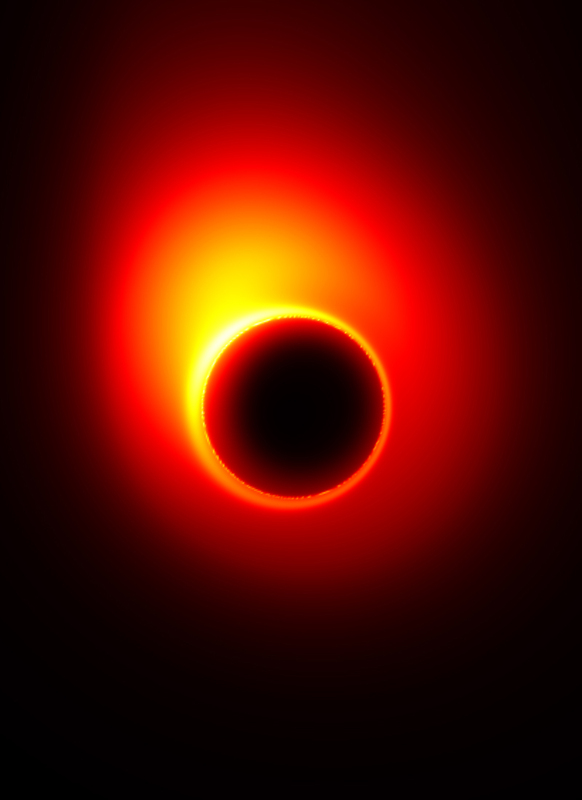 Ditto for big things you can’t see — like a black hole holding the mass of a billion suns. The jet emerges from the center of the galaxy (left) and shoots hundreds of thousands of light years through space. Blobs along the jet show ultra-intense bursts of photons created millions of years ago, perhaps when the hole inhaled entire stars. Galaxy M87 in the constellation Virgo, about 50 million light-years distant. In a study published today, a group of scientists has linked the two, forging a clearer picture of how a gargantuan black hole in galaxy M87 is spewing a jet of light far longer than the galaxy is wide. Black holes exist at the center of most galaxies. Now, using four radio telescopes spaced up to 4,500 kilometers apart, Sheperd Doeleman of MIT and colleagues have tracked the source of M87’s jet right down to edge of the blackness we call the black hole. Albert Einstein taught that intense gravity bends space-time, and thus light. Nowhere is this more evident than around a black hole, whose stupendous gravity prevents light from escaping. 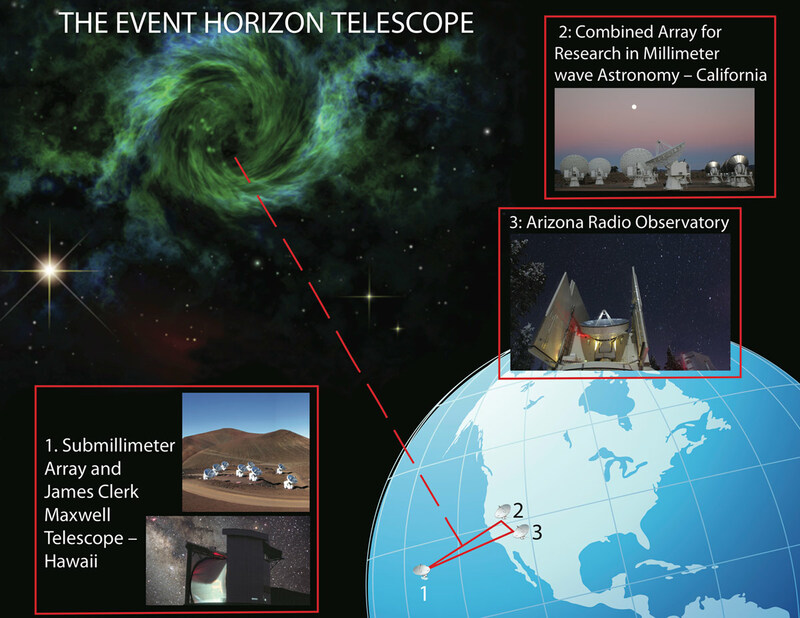 The event horizon, with its chaotic collisions of hot matter, creates massive amounts of X-rays and radio waves, which is what Doeleman is measuring with the “Event Horizon Telescope,” that merger of radio telescopes in Arizona, California and Hawaii. By reading short wavelength radio waves, and using a good estimation of the distance to M87, Doeleman and colleagues were able to get a precise fix on the source of the jet. “Until now, we did not have a telescope with magnification powerful enough to resolve this region around the event horizon, so this has been the purview of computer simulations,” Doeleman says. 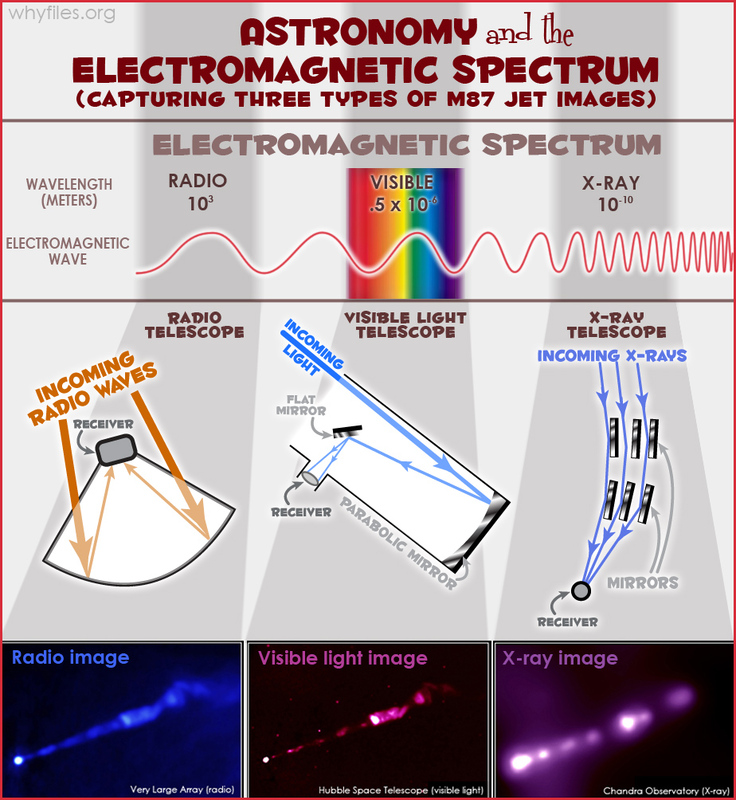 The electromagnetic spectrum spans very high to very low frequency waves. On the low end are radio waves, on the higher need are X-ray waves, and in the middle of both are visible light waves. In order to capture images of each type of energy wave, different technology is needed. See the three types of telescopes used to turn radio, visible light, and X-ray waves into the photographs of particles streaming away from the black hole in galaxy M87. The jumbo combine of radio telescopes adds signals from the individual telescopes to give 2,000 times as much resolution as the Hubble Space Telescope. The system could, theoretically, see a grapefruit on the moon. If the grapefruit held a strong radio transmitter. In other words, the enormous telescope, reading short radio waves, can see enough detail to see the jet being born just above the event horizon. The photons — particles of light — are created through synchrotron emission: when a charged particle is accelerated, it makes a photon. By tracking radio waves from three locations, scientists have created a virtual telescope with a 4,500-kilometer receiver, giving an unprecedented view of the goings-on above a black hole. A new link-up to a telescope in Chile has raised the baseline to 9,450 kilometers, giving a stunning resolution of 8 billionths of a degree! The known universe requires black holes! 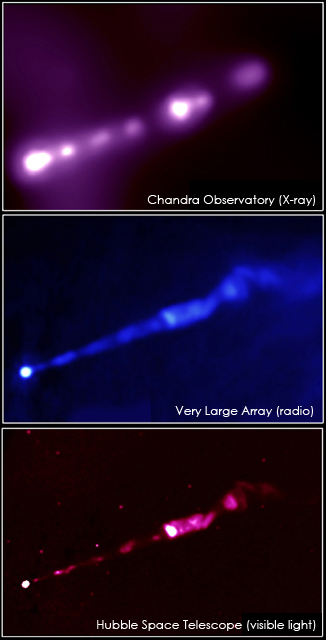 X-Ray Astronomy #2: It’s Results Time!